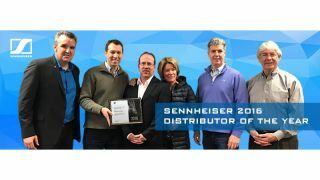 In a celebration of the relationship between the two companies, Sennheiser USA presented TMP-Pro Distribution with the 2016 Professional Systems Distributor of the Year Award on March 10. Michael Cleary, Sennheiser USA area sales manager, and Chris Clay, director of sales for Sennheiser USA, were on hand to present the award to the TMP-Pro Team. "Sennheiser is proud to name The Music People our 2016 Distributor of the Year," Clay said. "The award recognizes outstanding sales, service, and representation of the Sennheiser Brand and TMP is more than deserving. As we close in on 30 years of partnership, we are appreciative of the past and excited for the future. We look forward to many more years of continued success. Congratulations to The Music People!"